Tai-Chang Chiang and graduate student Caizhi Xu pose in Chang's laboratory at the Frederick Seitz Materials Research Lab at the University of Illinois at Urbana-Champaign. Photo: Physics Illinois. In a surprising new discovery, alpha-tin, commonly called gray tin, exhibits a novel electronic phase when its crystal structure is strained, putting it in a rare new class of three-dimensional (3D) materials called topological Dirac semi-metals (TDSs). Only two other TDS materials are known to exist, discovered as recently as 2013. Alpha-tin now joins this class as its only simple-element member. This discovery, which is reported in a paper in Physical Review Letters, holds promise for novel physics and many potential technological applications. It is the work of Caizhi Xu, a physics graduate student at the University of Illinois at Urbana-Champaign, working under Tai-Chang Chiang and in collaboration with scientists at the Advanced Light Source at the Lawrence Berkeley National Laboratory and six other institutions internationally. TDSs exhibit electronic properties akin to those found at the surface of the now much-studied topological insulators (TIs). At the surfaces of TIs, electrons are able to conduct freely, like in a metal, while the ‘bulk’ or interior acts as an insulator. The surface electrons behave as two-dimensional (2D) massless, spin-polarized Dirac fermions that are robust against non-magnetic impurities, giving them potential applications in spintronic devices and fault-tolerant quantum computing. By contrast, the bulk electrons in TDSs can behave as massless Dirac fermions in all three dimensions, which leads to additional possibilities for novel physical behaviors. "TDSs are of profound interest to condensed matter physicists, primarily because they exhibit a number of novel physical properties, including ultrahigh carrier mobility, giant linear magnetoresistance, chiral anomaly and novel quantum oscillations," explains Xu. "Secondly, this class of materials can realize many interesting topological phases – under controlled conditions, the material can undergo phase transitions and can become a topological insulator, a Weyl semimetal or a topological superconductor." Tin has two well-known allotropes: at 13.2°C and above, white tin, or beta-tin, is metallic; below that temperature, the atomic structure of tin transitions, and the material becomes gray tin, or alpha-tin, which is semi-metallic. In thin films grown on a substrate such as indium antimonide (InSb), however, the transition temperature of tin goes up to 200°C, allowing alpha-tin to remain stable well above room temperature. Normally, alpha-tin's diamond-cubic crystal structure exhibits an ordinary semi-metallic phase – and the material has no common uses at the present time. In fact, gray tin can be problematic in many applications that involve tin – the so-called ‘tin pest’ problem involves the formation of gray tin that can cause disintegration of parts containing white tin. In their experiment, Xu and his colleagues engineered a strain in the material by growing layers of alpha-tin on a substrate of InSb, which has a slightly different lattice constant. "That lattice mismatch leads to strain, or compression, in the alpha-tin," Xu says. "It was believed that strain would open a band gap in gray tin and turn it into a TI. In a few recent studies researchers observed topological surface states in strained tin, but they didn't observe the strain-induced band gap because they were not able to access the conduction band. In this study, we used potassium doping and with this simple method were able to reach the conductance band. We were able to see the gapless and linear band dispersion that is the hallmark of a Dirac semi-metal. "This discovery is kind of unexpected. I decided to study the material because of its known TI phase. Once I dug into the experimental results and performed some theoretical calculations, what I found is that alpha-tin under a compressive strain is not an insulator, as had been thought. It turns out to be a Dirac semi-metal. Our calculations also show that it is only under a tensile strain that alpha-tin becomes a TI." Chiang believes these findings will open up new avenues of research. 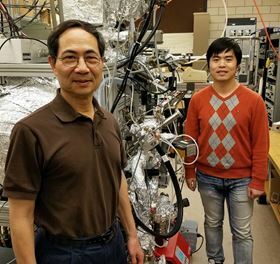 "Caizhi Xu's work illustrates that interesting new physics can still be found in simple common materials, such as gray tin, which has been known and studied for decades," he says. "It's clear from this study that strain engineering can open up many possibilities. My group is currently exploring a different way to apply strain, by mechanically stretching a sample. The strain will be uniaxial – along one direction only – and it will be tunable, but limited by sample breakage." Mankind has extracted and used tin in alloys since the Bronze Age, around 3000BC. Before the advent of aluminum cans, tin cans, which were actually steel lined with tin, were used for preserving food. This new discovery could allow alpha-tin to be a highly useful material in future technologies. "Potential applications of alpha-tin as a topological Dirac semi-metal could include taking advantage of its high carrier mobility to generate ultrafast electronic devices. Additionally, the giant magneto resistance could be useful in developing ultra-compact storage devices, like computer hard disks," suggests Xu. "Furthermore, this material could be a platform for further fundamental research related to optical properties, or to transport properties, including superconductivity. There is even potential that it could be used as a platform to realize Majorana fermions. I believe our new finding will be of interest to many physicists."